New sheetmusic book – Claasagh volume 2. 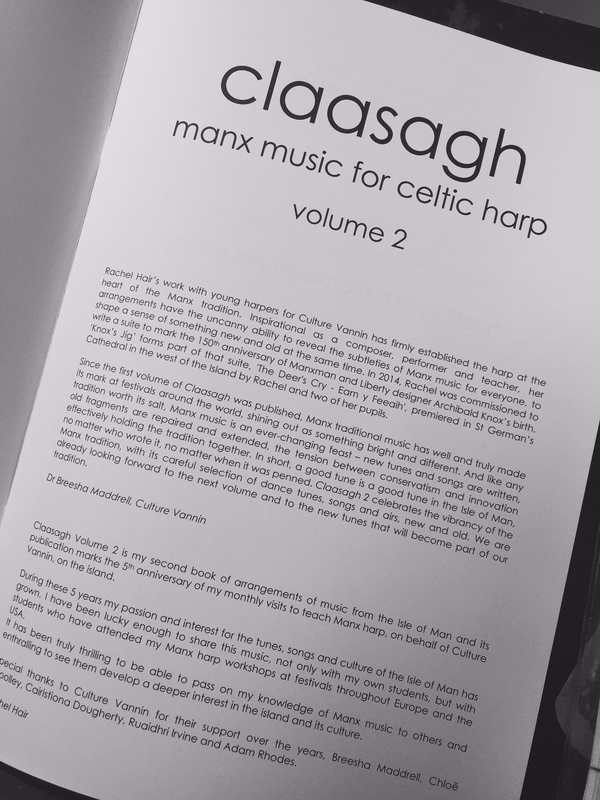 Over the past few months I’ve been busy collating and writing arrangements of tunes from the Isle of Man, both old and new, and finally I’m excited to finally release my second volume of “Claasagh – Manx music for celtic harp”, ready for you to buy via the website shop. The first volume of Claasagh contained only traditional tunes, but this time around, I’ve included 20 arrangements of tunes written by musicians living on the island today. The book progresses from elementary to advanced and I’ve included information on each of the pieces to give you some of the background and history of them. I’m also thrilled that Dr. Breesha Maddrell, the director of Culture Vannin has written a forward for it. Have a look below at what she’s said.